The historic heavy metal band EMERALD from Holland, will play one show in Athens. 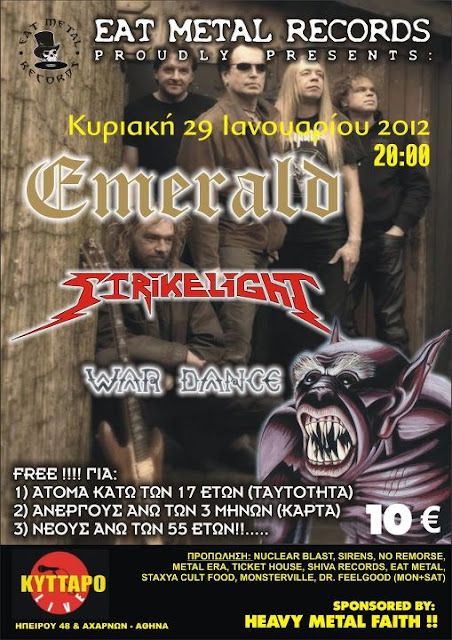 The gig will take place on January 29th 2012, at KYTTARO LIVE CLUB. The doors open at 20:00 and the first band will be on stage at 20:30. Support bands are STRIKELIGHT and WAR DANCE, 2 great Greek classic heavy metal bands. As usual… SPONSORED BY HEAVY METAL FAITH !!!!!!!! !